Do you prefer to eat Kampung Chicken rather than the commercially bred chicken? If you do, then head down over to Hutton Lane Penang. 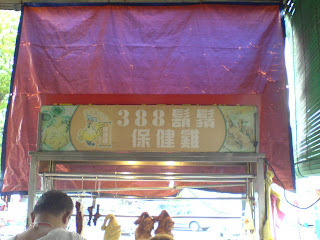 There is a stall that sells chicken rice and a variety of meat – roast pork, roast chicken and bbq pork. Their specialty is the Kampung Chicken. This variety of Kampung Chicken is known as “ang koo” in Hokkien or “woo so kie” in Cantonese. The meat is tasty and lean. The yellowish skin is much thinner and very smooth (doctors advised not to eat the skin but can’t resist!!!). It comes with steaming hot rice, garlic chili sauce and their special soya sauce with chopped chinese celery leaves. And also not forgetting the soup which has a bit of chinese kei chi and herbs. It is mild and very tasty…. Look out for this stall as you travel downwards in Hutton Lane. The coffeeshop is on your left, two houses away from the mosque. **Updated 2010** – The stall is no longer operating! 2 Responses to "Kampung Chicken Rice at Hutton Lane Penang"
Looks yummy. Will give it a try. Btw, have you tried the koay teow th’ng a few shop down (corner lot) selling only koay teow th’ng? It is opposite another kopi tiam. The koay teow th’ng there is nice, the fish ball is actually fish paste. RM 2.40 for small bowl without internal organs. If you prefer your koay teow with internal organs, then order a large one. My parents and I usually order the large one. I like the fish ball but I find the soup a bit oily.